The market towns of Norfolk are rarely as large and grand as those of adjacent Lincolnshire, or as beautiful and interesting as those of Suffolk, to the south. There are several reasons for this, not least that Norwich is a magnetic centre to its county in a way that Lincoln and Ipswich are not. Norfolk's market towns tend to be small - there are only six centres of population in the county with more than 10,000 people. But the size of the county, and its relative emptiness, gives them something that those in Suffolk, at least, rarely have: a sense of independence, and the facilities you'd expect of a much larger place. Take North Walsham, for example. Here in the heart of beautiful north Norfolk, removed from the tourist area of the Broads and the holiday coast, it's a Norfolk town for Norfolk people. At the heart of the town is the market place, with an unfortunate 1960s shopping precinct beyond it, and between the two this magnificent church. You don't get many tourists here, and on market day there's a real buzz of activity, Norfolk shoppers with Norfolk accents. At one time, this was an agro-industrial town, with light engineering firms producing farming equipment, and factories processing the produce. Wikipedia observes rather harshly that the town today reflects the trend towards homogeneity and suburban anonymity characteristic of many small British towns that have lost their primary role and function. And perhaps this is true. 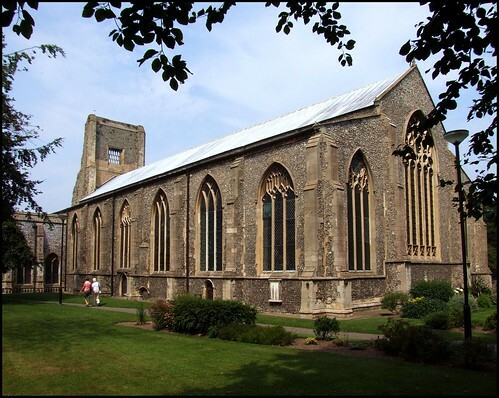 With a population of 12,000, North Walsham is the sixth largest town in Norfolk. The thing you always remember the church for, and perhaps the town, is the collapsed west tower of St Nicholas. It is not unique in Norfolk by any means, but no other ruin of a tower is on such a huge church. And this is a great barn of a building, the chancel and nave running under one continuous roof with aisles right to the east wall. The tower came down in successive collapses in the 18th and 19th century, and there is a functional vestry built into the base. I have a vivid memory of standing under this ruin at the age of about twelve, and being completely awed by it. The vast 14th century porch is in proportion, and you step through it into the vastness. The width of the interior is accentuated by the elegance of the arcades, and also by there being no clerestory, which makes the roof seem almost oppressive in its lowness. Fortunately, the building is full of light, because the Perpendicular windows to south and north have mostly clear glass surrounding coloured images of good quality. This is, as Sam Mortlock observed, a grand town church, with much of interest. The great treasure of St Nicholas is the rood screen dado with its painted Saints. That there are twenty panels between the arcades gives some idea of the width of the nave. Some are Apostles, and some are female martyrs, but the two best and most interesting panels depict the Annunciation, an unusual feature on a rood screen; there are only about half a dozen of them in East Anglia. On one panel, St Gabriel bends his knee, and lifts his hand in an elegant gesture, while in the other the Blessed Virgin looks on and listens demurely. Among the women are St Catherine, St Barbara, St Margaret and St Mary Magdalene. I liked St Jude with his boat very much - he seems a jolly character. In the north chancel aisle there are parts of another screen, presumably once a parclose. It is not as beautiful, but is perhaps more interesting, not least for being later. This time, the Apostles are carved into the spandrels, and the dedicatory inscription that runs along it has been vandalised by iconoclasts, probably in the 1540s, which would have been not long after it was made. In the other chancel aisle there are some good misericords, including a magnificent woodwose, an East Anglian wild man, setting off to hunt lions with his rough-hewn club. One of North Walsham's most famous residents sleeps on up in the chancel. He is William Paston, founder of the grammar school, who died in 1608, and he rests in full armour on his side within an elegant and not overwhelming monument. Mortlock points out that, as a sign of Paston's meticulous nature, he designed the memorial himself before he died. Well, it's best to know what you're getting. Back at the west end, the towering 15th century font cover is reminiscent of Suffolk's finest at Ufford, more than it is of the one at Elsing, not far off. Other medieval survivals include a number of brass inscriptions, as well as no less than two chalice brasses to early 16th century Priests. I often moan about town churches. Often, they are Victorianised to within an inch of their lives, and would not be out of place as Anglican churches in Melbourne or Calcutta. And sometimes, they are kept locked, creating a deadness that kills the feeling of a small town. Let it be said then, that not only is St Nicholas fascinating, it is one of the most welcoming churches in Norfolk, and that, although we were in here for almost an hour, not once did we find ourselves alone in the building. All the time, people were popping in for a wander or a quick pray, as if this were some provincial cathedral city rather than a small market town. At one point, I looked around to count a dozen other visitors, which is exactly as it should be, and for which the parish should be warmly congratulated.